Woods shot a 70 on the final day of the premier golfing event in Augusta, Georgia, to claim his first green jacket in 14 years and his fifth overall. 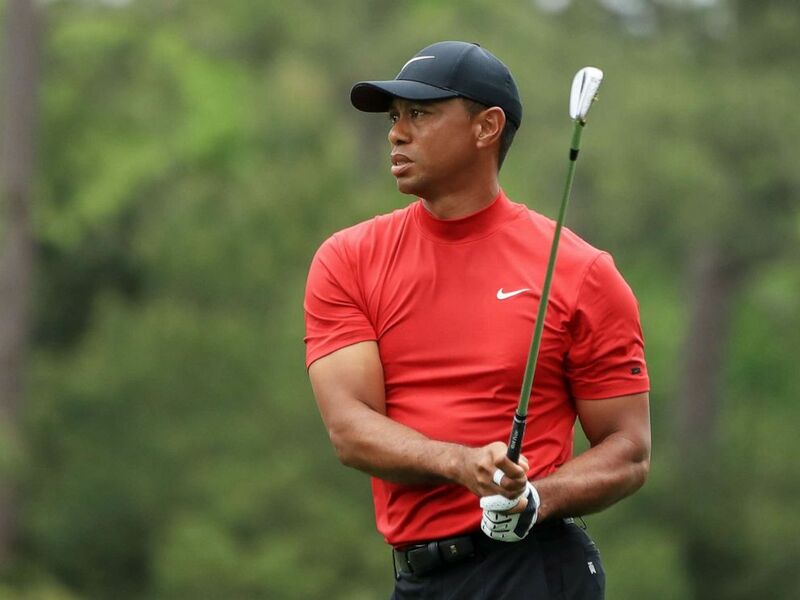 He won the tournament by a single stroke, sinking a foot-long putt on the 18th hole and pumping his right fist before throwing his arms up in the air as thousands of fans erupted in chants of "Tiger! Tiger! Tiger!" 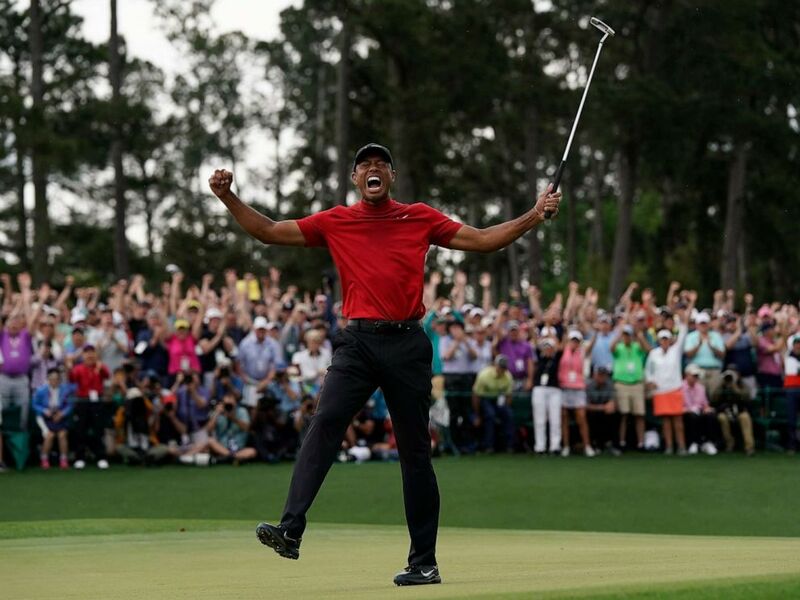 Tiger Woods reacts as he wins the Masters golf tournament, April 14, 2019, in Augusta, Ga.
"When I tapped the putt in I don't know what I did, but I know I screamed," Woods said after the tournament, as Patrick Reed, the 2018 Masters champ, put the traditional green blazer on him. "It's come full circle. My dad was here in 1997 and now I'm the dad with two kids there," Woods said. "It's just unreal for me to experience this. I just couldn't be more happy and excited." Even President Donald Trump congratulated the golfer, tweeting, "Love people who are great under pressure. What a fantastic life comeback for a really great guy!" The victory marked Woods' 15th major championship win, and his first since winning the 2008 U.S. Open at the Torrey Pines Golf Course in San Diego. 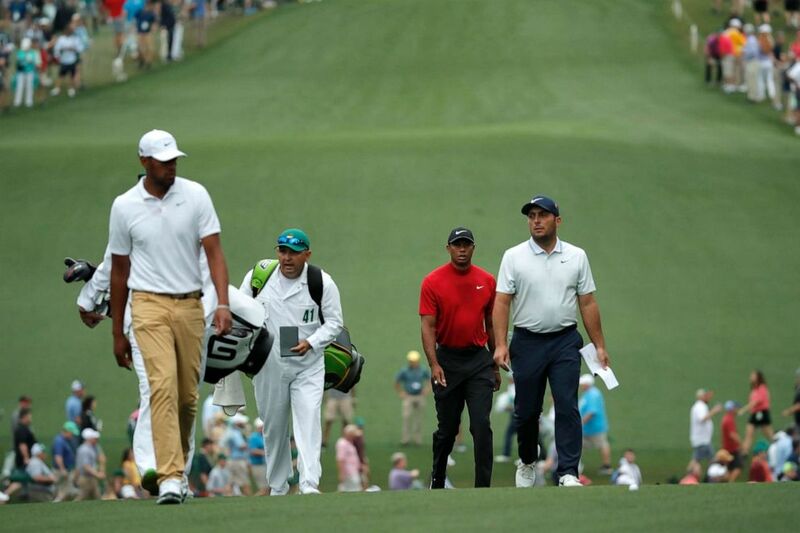 Francesco Molinari, Tiger Woods and Tony Finau walk up the first fairway during final round play at the Masters in Augusta, Ga., April 14, 2019. Following his 2008 U.S. Open victory, Woods' professional and personal life began to unravel. An infidelity scandal in 2009 tarnished his image, cost him endorsements and forced him to issue a public statement, saying, "I have let my family down and I regret those transgressions with all of my heart. I have not been true to my values and the behavior my family deserves." Woods's marriage to model Elin Nordegren, the mother of his children, ended in divorce in 2010. Tiger Woods plays a shot on the first hole during the final round of the Masters, April 14, 2019, in Augusta, Ga.
Woods began to find his stroke again last year in September when he won the Tour Championship at the East Lake Golf Club in Atlanta. While it wasn't a major championship, it marked Woods' first win on the PGA circuit since 2013. "It's overwhelming, I think, just because of what has transpired," Woods said in his post-match interview on CBS. "Last year, I was just very lucky to be playing again."